Leveraging the efficiency and flexibility of MS Hyper-V Development, we provide a comprehensive set of scalable and cost-effective cloud solutions. 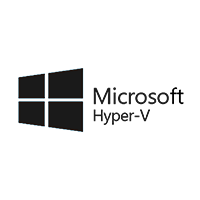 Hyper-V server provides a simple solution for server virtualization to organizations of any dimension. Leveraging the power of Hyper-V, we enable our clients to virtualize storage, strengthen hardware infrastructure, and minimize data center footprint. This facilitates their virtualized environment to use 50% less storage. As a Microsoft Certified Partner, we bring to you the aces of virtualization through MS Hyper-V, providing virtualization and consolidation services that can bring tremendous efficiencies to your IT infrastructure turning your data center into a flexible and scalable sophisticated asset. With the rapid modernization of technology, virtualization has become an important part in business endeavors. MS’s virtualization software, Hyper-V, helps enterprises in creating and hosting virtual machines, on x86-64 systems. When the IT infrastructure through the network gets exposure to these virtual systems, they facilitate effective access of mission-critical data, cloud-based applications, and a full virtual desktop infrastructure, without running the information locally. With Rigel Networks, procuring MS Hyper-V solutions and services is a valuable investment. We provide Hyper-V both as a stand-alone solution or an addition to Windows Server 2008 R2. Taking the advantages of this flexible virtual environment, we make sure that your resources are being deployed in the best possible manner. We give utmost value to our clients and their requirements, meeting with the demands of their most intense workloads. Our understanding of the importance of modern data and its capability facilitates providing highly optimized and high level performance for the key workloads of your business through, none other than, MS Hyper-V. Your quest for MS Hyper-V solution ends here. With our experience and expertise in virtualization technologies, MS Hyper-V in particular, we are all geared up to offer you the best MS Hyper-V technology solution with a collaborative customer engagement.